ClearShield “Non-Stick” Glass is a unique and higher quality of glass, which can be kept looking and performing like new for life. ClearShield glass keeps its promise of clarity, visibility and easy clean. ClearShield glass works like “Non-Stick” cookware. It is much easier to clean and stays cleaner for longer no need for harsh abrasive cleaning products. Resists staining and discoloration keeping it’s “as new” appearance and performance much longer. Stay’s cleaner and brighter for longer between cleaning improving general appearance, performance and customer satisfaction. When a simple and economical cleaning program is followed, ClearShield glass looks and performs like new for years depending on environmental conditions. What is the after-care program and what is its purpose? A routine after-care program using especially formulated products to enhance the appearance and performance of ClearShield glass. A conditioner is used on a periodic basis to rejuvenate the ClearShield treated glass whenever there is a reduction in performance caused by atmospheric pollution. This will increase the ClearShield service life. A new specially formulated two in one after-care been developed also for routine maintenance. A booster coat can be applied to restore the appearance and performance of ClearShield glass at the end of its service life. How long is the service life of ClearShield Glass? When the After-Care Products are applied in the advised manner, on average (10) years for external glazing under normal environmental conditions. For shower screen glass 5-8 years, since the introduction of conditioner, this will depend on water conditions, and the exposure of the glass. How is ClearShield Glass Made? By a Special process (Called ClearShield System) which cross-links with the glass surface and converts ordinary glass into a “Non-Stick” easy-clean surface. That is chemically inert to most substances. Where is the conversion process carried out? 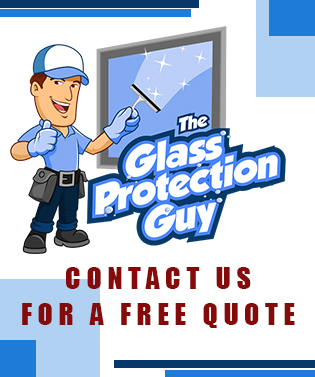 This process can be carried out on new glass in the factory, or by a trained applicator on site after the glass has been installation in buildings etc. Does this have any effect on glass color, optical properties, or light transmission? No, except to maintain the original performance by keeping the glass cleaner and brighter. Does ClearShield “Non-Stick” Glass require cleaning? YES!! Just as “Non-Stick” cookware needs some cleaning, so does ClearShield Glass. On average, cleaning is required less than half as often as untreated glass. 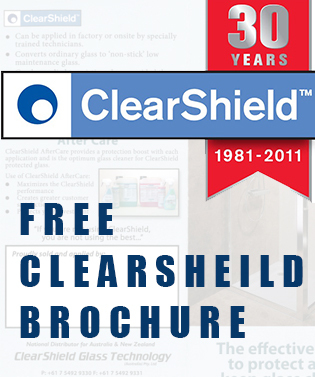 This depends upon where and how ClearShield Glass is produced. If produced in factory, the cost depends mainly upon the type of glass and method of production. If produced on site, the cost of converting ordinary glass to ClearShield Glass depends on the type of glass and accessibility, extra labour, travel etc. What if the glass is already installed and has become stained? For glass already stained and discolored. If the ClearShield Renovating System can restore the surface of the glass to its original and “as new” appearance, then we can treat the surface of glass with ClearShield. However most shower screens will need to be replaced. What will attack ClearShield Glass? Similar to “Non-Stick” cookware, abrasive cleaners and harsh chemicals can attack the surface of ClearShield Glass. However, such products are not necessary due to the “easy-clean” properties of ClearShield Glass. Can ClearShield be used for plastics such as acrylics or polycarbonates? No. ClearShield only works on vitreous surfaces such as glass, ceramics and porcelain. It washes off other surfaces. How do we clean ClearShield “Non-Stick” Glass? Ritec has developed special after-care products to maintain the performance and appearance of ClearShield Glass for many years. 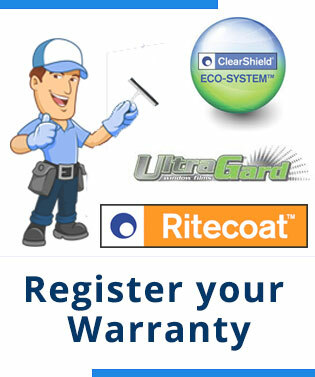 Is it necessary to use Ritec special cleaning products for maintaining ClearShield Glass? Ritec products are recommended because they are specially formulated to maintain the appearance and performance of ClearShield Glass. Other products may be used provided they are not abrasive and do not leave a residue or film. Other products are not recommended.